I made it, my fifth blogiversary! First, let's get to the good stuff--prizes! And promised to divide it up among 3 commenters. 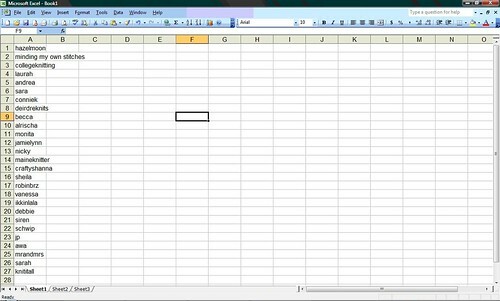 And then used randomnumber.org to pick 3 random numbers: 14, 3 and 6. So our winners are . . .
And what have they won? 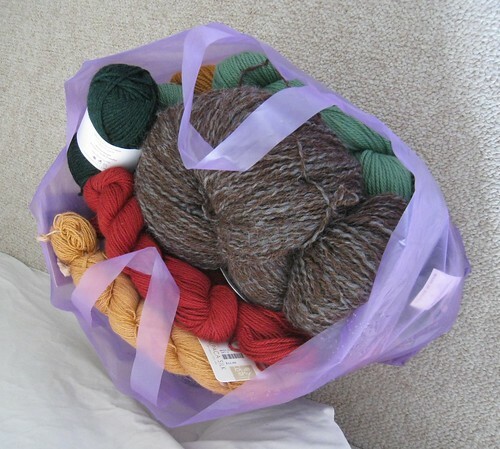 Let's take a closer look at the contents of the bag o' yarn, shall we? It's quite a mix of yarns! 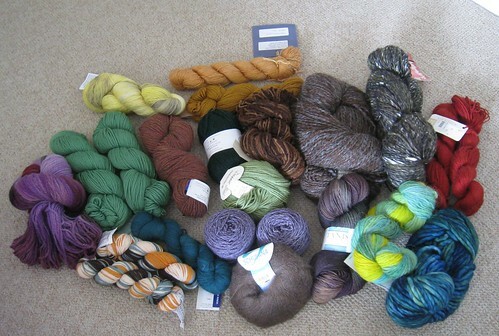 Most of it is still labeled, though a few skeins are not and I'll try to answer any questions about mystery yarn. Off the top of my head I can tell you that there's some Spud & Chloe, Blue Sky Alpacas, Berroco, Malabrigo and Knit Picks in there. So, winners, please send me an email ASAP at mediaperuana at gmail dot com with your mailing address, and I'll get your yarn out during the coming week! Five years of blogging. I haven't always had something interesting to say--maybe I've never had anything interesting to say, I don't know--but my blog has provided a wonderful outlet for me, and I greatly appreciate all of your support through the years. I hope you'll continue to visit Learner's Per-knit as I work to expand it and add additional content (tutorials, reviews, and giveaways), as well as expand my pattern collection. So again, thanks so much for reading, and I hope you'll stick around!